Given that LED lighting is all the rage at the moment, is it a great surprise that another LED product comes up for review? Not at all. This post looks at the DETA DET190 7W Warm White Dimmable LED Downlight, with a claimed 500 lumen output and 30,000 hour lifetime. 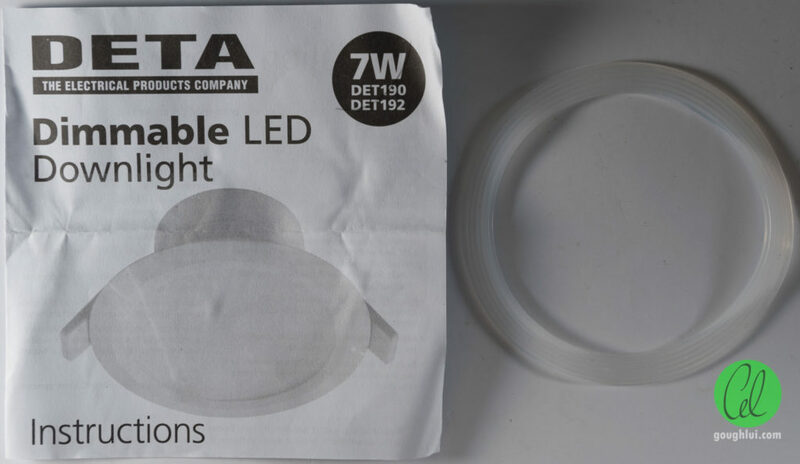 The DETA branding immediately tells me that this was probably obtained from Bunnings Warehouse, although I can’t find the product there, nor on DETA’s own website. I suspect this model may be discontinued, but it’s probably still worth looking at. (Update: After checking again on 20th June, the item appeared under my local Bunnings at a list price of $19.90). New models may use a different supplier with a different design. DETA is an Arlec brand, and judging from my past experiences with their products, I don’t expect anything special. But lets keep an open mind and find out. This product was contributed by a concerned reader for review under review challenge terms. The unit is packaged in a full colour glossy fold-open cardboard box with a very blue looking face. The top advertises its 500 lumen output, 7W power consumption, built-in LED driver and a 1.2m flexible lead and plug pre-fitted. With just 500 lumens of output, its light is roughly equivalent to that of a 31W incandescent globe, so you’re probably going to need a few. The side lists some specifications – notably that for a 7W light, there are 7 pieces of LEDs, so about 1W per unit. The beam angle is quoted as 100 degrees, so it’s a little wider than some other downlights. By comparison, halogen MR16 lamps often come in 38 degree and 60 degree spread, and other LED downlights are close to 90 degree. The unit claims compatibility with trailing edge and universal dimmers, and 30,000 hour lifetime. It has an IC abutted and covered rating, allowing for insulation to abut and cover (but not loose fill type). This is one step below IC-F/IC-4 which are fire-resistant insulation contact ratings which have to pass through additional testing. The required cut-out is 70mm, making it a smaller unit. One of the bigger disappointments is a lumious efficacy rating of 71 lumens/Watt. Some of the better retrofit globes on the market can surpass this, with 100 lumens/Watt being an achieved target at least a year ago and products approaching and meeting 120 lumens/Watt a reality today. As a result, you will end up paying for almost twice as much in electricity for the same amount of light, and get a little more heat out as a result. 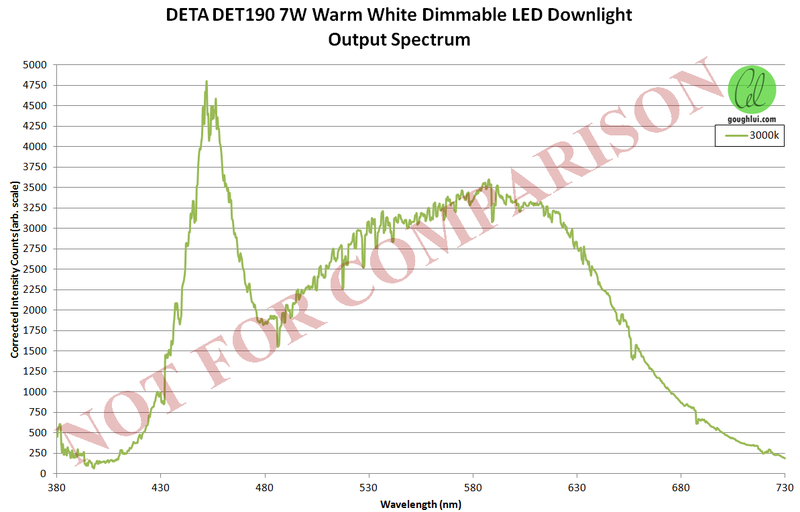 Rather annoyingly, the specifications miss out on CRI, and other measures of spectral quality such as SDCM which might be of greater importance if you wish to be sure your LEDs render colours properly and match in colour across the room. The underside has a full pictorial with measurements. It also has the caveats – namely, the rated lumens are an average (but what about the standard deviation?) and the operating hours is calculated average rated life. I wonder what that means? Was it tested? What was it calculated from and how? Maybe calculated from the average rated life of its components? How were potential failure modes accounted for? It is a little confusing, but I suppose other manufacturers may be doing the same, just without telling us about it. Inside the box, we get a fold-out leaflet with instructions, and a ribbed clear silicone gasket to help the downlight seal around the opening. This is particularly useful, as it (along with covering/abutting insulation) can reduce heat loss through the downlight, resulting in a more efficient home. A quick read-through of the instructions gave me a chuckle. Note what it says in Step 5. Yep, it says for you to cut a 92mm diameter hole in the mounting surface. Problem is, the unit only has a 90mm face, so the whole unit’s going to fall through. The illustration in the corner is correct though, so it should be a 70mm cut-out. 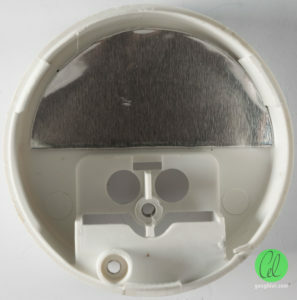 I suppose if you’ve made that mistake, your option is to buy a different downlight to fit the hole. The clearances required to combustible elements and structural elements is >25mm which is easily satisfied in most cases. 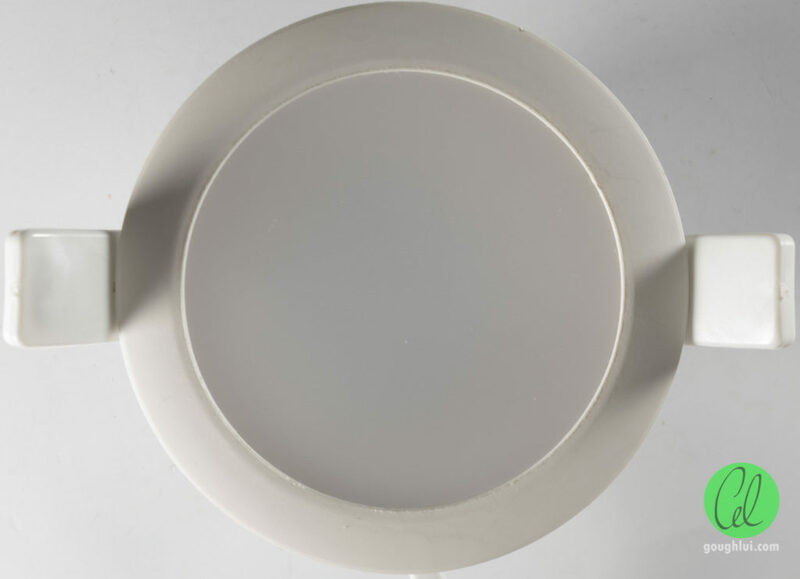 The downlight has a 45mm height, so even fairly tight ceiling spaces can be accommodated. Reading the manual, I did not identify any IP rating for the fixture, and it seems to state it is suitable for indoor use only. Furthermore, the warranty for the unit is one year only, which is on the short side. Looking at it externally, the item conveys some promise, with moulded branding on the rear cap which suggests they went to at least some effort to customize the unit. As the unit has an integrated driver, like most, this is a blessing and a curse. 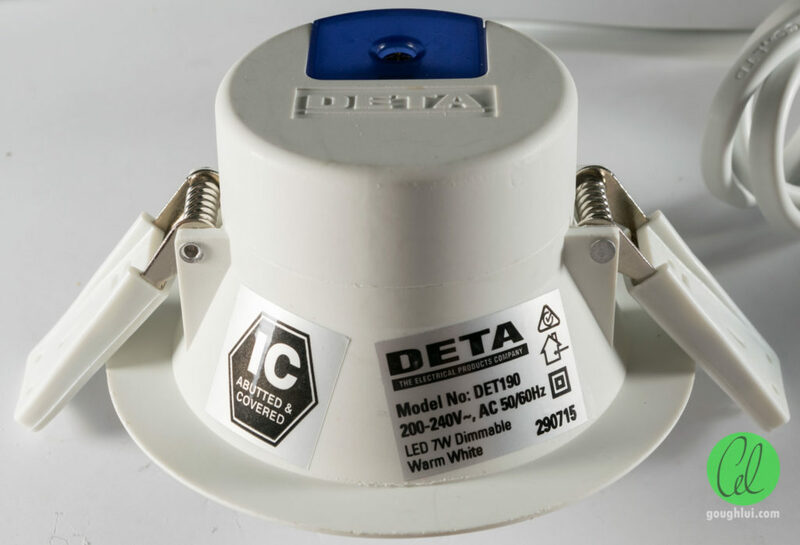 In the case of the DETA, the driver is sitting right on top of the LED assembly with no air gap, and is fully enclosed to comply with insulation abutment requirements. The result is a hotter running driver, and possibly reduced lifetime. The labels are affixed to the side, which feels to be plastic. The nameplate rating lists 200-240v rather than the more common 220/230 lower bound, which is also interesting. It sports the regulatory compliance mark, and is double insulated. While it is dimmable, they did not place the dimming logo on the package. 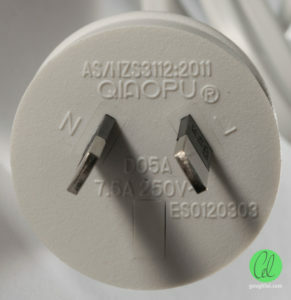 The supplied flex is from Ningbo Qiaopu Electric Co. Ltd, with the plug sporting the ESO number, and the cable clearly showing the SAA number. 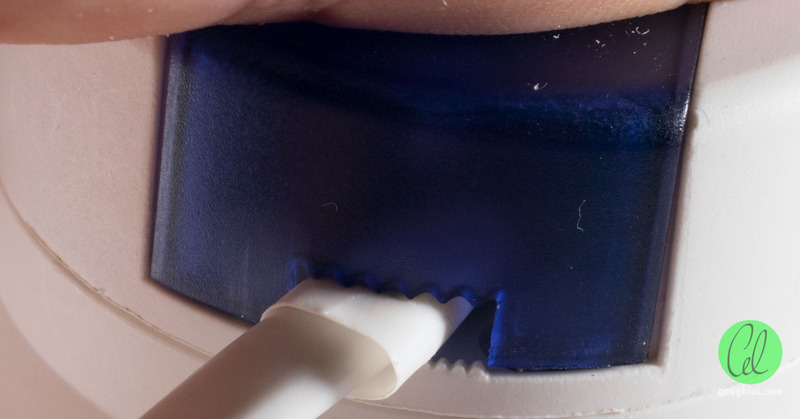 What is the purpose of a cable retention mechanism? To hold the cable in place and prevent any stress on the electronics inside. It looks like this cable retention mechanism scores an outright fail, because it is at its lowest limit and … even with the supplied “sleeve” over the cable, the cable slides about freely from side to side and in and out. 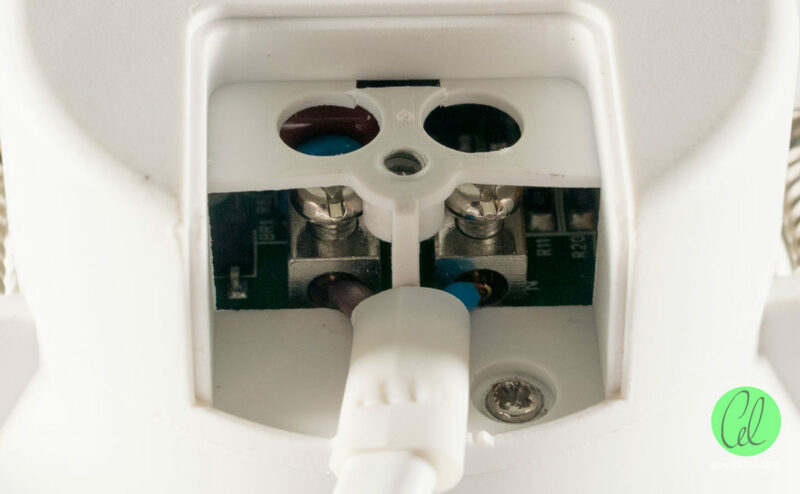 If someone were to trip on the cable, it could have nasty consequences, such as the cable pulling out of the terminal block or damage to the driver internally. How did this ever pass the safety check is beyond me. The front of the unit sports a simple design with opalescent plastic diffuser sitting almost entirely flush with the white bezel. The depth of the trim is very thin which makes for a low profile which may be more aesthetically pleasing. Fitting is by spring-loaded rat-trap style metal legs with plastic cover protection. Not satisfied with just looking at the unit from the outside, I was itching to peer inside to see what was happening there. We start by removing the terminal block cover, which is of a screw-down design with non-captive screw. Immediately, two things strike me. The rear cover is secured by a screw, which is probably a good idea to prevent it from being accidentally knocked off, but the head was stripped during manufacture. As a result, I have to question the level of process control they have. The second observation was that the holes in the casing didn’t quite line up properly with the terminal blocks. This was extremely apparent from the front side. This makes hard-wiring the unit properly a very difficult job, and also implies that the internal driver might have been designed for a different casing and then shoehorned into this one. Because of the plastic divider between the active and neutral (just a single small piece of plastic, about the thickness of a toothpick), I had to remove the flex in order to remove the top cover. Underneath the top cover, there was a piece of adhered foil. I couldn’t really work out what it was for – if it was for RFI suppression, it has no connection to any ground and can’t sink any current. If it were acting as a heat-spreader (say in tablets and mobile phones) to avoid external hot-spots, it didn’t do a great job because its metallic silver colour reflects radiant heat rather than absorbing it. Maybe it was to ensure failed components had less chance of burning through the top of the casing … but that’s a guess, and doesn’t explain why there is no protection on the side casing where fuses and fusible resistors are nearby. Looking at the PCB from the top, we can see a somewhat cramped design using a higher quality double-sided type PCB with silkscreen and solder resist. 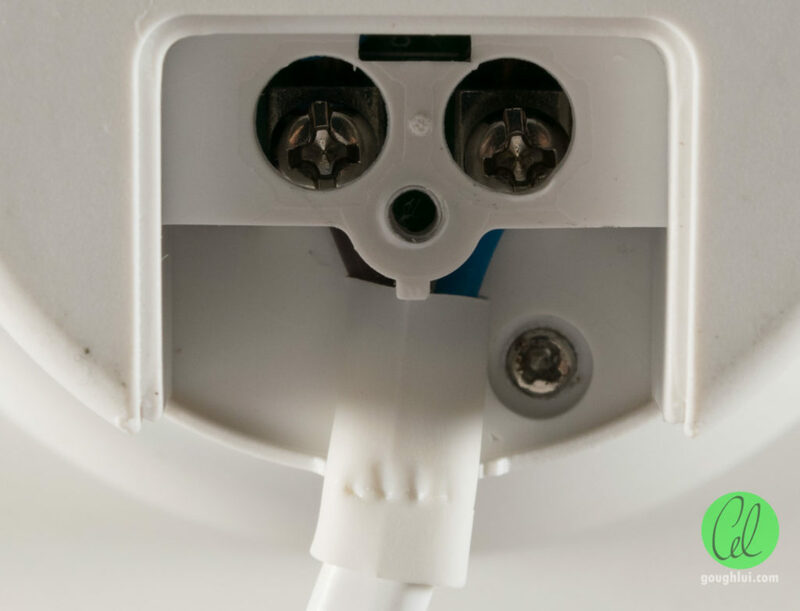 The mains terminals are precariously close to the components, and without official guidance on wire stripping lengths, it could be possible to accidentally cause a failure. The live terminal is really relying on the paint-coating on the capacitor behind for maintaining insulation. Not good. To the left, the incoming mains is fed into a fuse, wrapped in heatshrink to improve safety. The output capacitor is also wrapped in heatshrink. There are a few inductors to filter noise, and resistors appear to be fusible type for added safety on the primary side. A MOV for transient surge protection is also seen (MOV1, leftmost blue component). 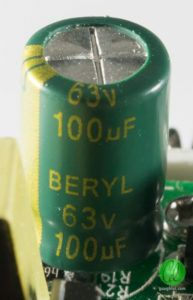 Some primary side polyester capacitors can be seen as well, but not mains-safety rated types. This is probably acceptable as the unit is double insulated, and fused. 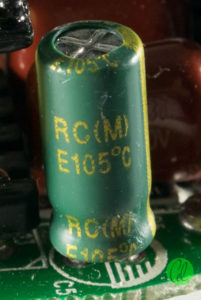 Also visible is one high voltage 600V N-type MOSFET transistor, an ISU04N60A. A quick look at the terminal blocks reveals some rather sketchy soldering with solder seemingly overflowing to the top surface near the cable entrance. However, this turns out to be a good thing, as it provides additional mechanical support to the terminal blocks. 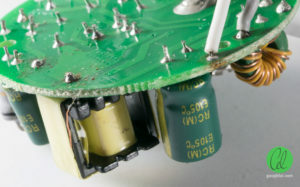 The way the fuse leg is soldered suggests there is quite an element of hand-soldering in the assembly process, and some of them apply too much solder and possibly not enough heat. Looking at some of the more heat sensitive components on the board, namely, the capacitors, my heart sinks. 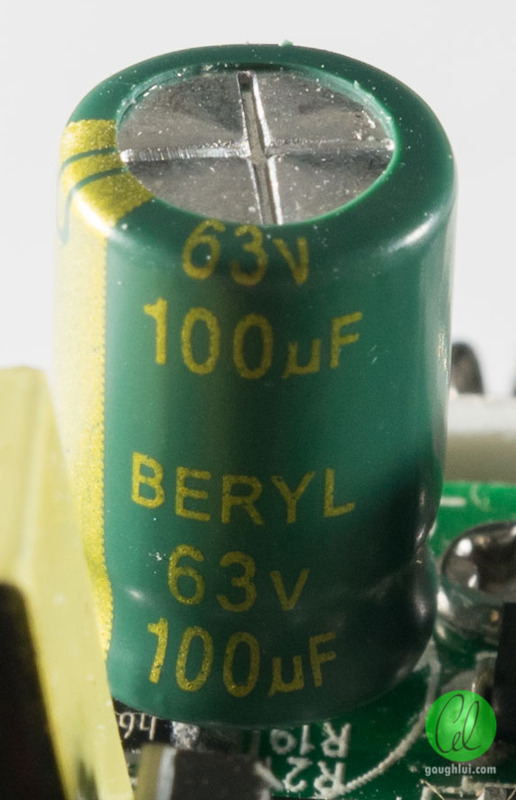 Beryl capacitors are not particularly reputable, so their performance in the field may be somewhat variable. Both capacitors are part of their RC series rated at 105 degrees Celsius. Their manufacturer rated lifetime is 2000 hours at the rated temperature. 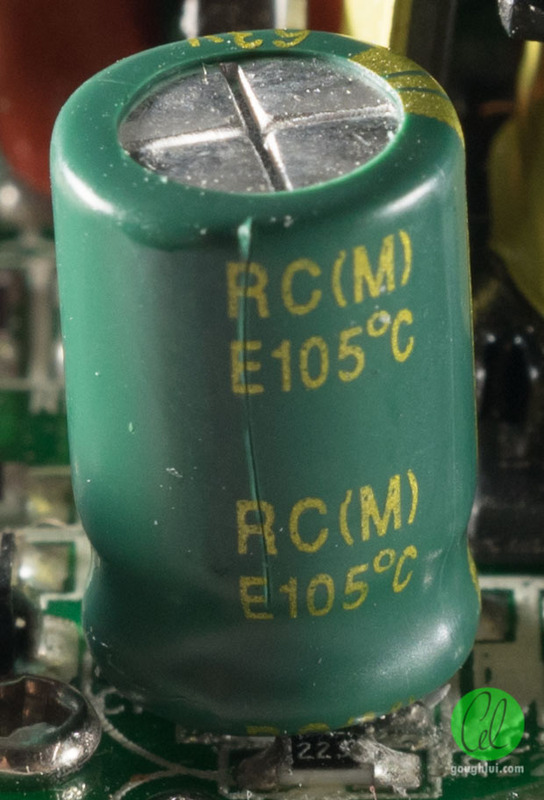 This means that, for the unit to achieve a 30,000 hour lifetime, assuming the manufacturer ratings hold, the temperature of the capacitor must not rise to above 65 degrees Celsius (based on a doubling of lifetime for every 10 degree decrease rule of thumb). This seems quite difficult to achieve, especially because the driver is adjacent to the LEDs, and the unit can have insulation abutted to it. 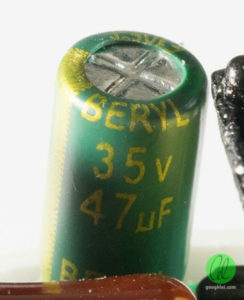 It seems likely that the capacitors could be a limiting factor to the lifetime of the unit, but it is noted that the design only has secondary side capacitors where their failure will probably manifest itself as higher peak currents into the LED, causing more flicker and stress, before outright failure of either the LEDs themselves or the circuit in keeping regulation. Just when you thought your day couldn’t get any worse, we get to the underside of the board. The terminal blocks seem to have had solder slathered onto it, but then, they realized that the z-height of the joint would not fit into the case, so they “cut off the excess”. Not good to see, and not a common manufacturing process either. A few small flecks of solder were seen as well, nothing too major. Most through-hole legs are quite decently soldered. However, the connections to the LEDs are not. The positive lead on the left, is hanging on by three strands, and the negative lead definitely is a cold joint. While the unit appears to function, such manufacturing really shows how “slim” the margin is to failure. It seems that the wires should have been inserted through and soldered through, but they were a little too lazy so they just “tacked” it on. We see this from time to time in cost-sensitive lighting applications, but this is just about the worst example I’ve come across. This leads to the obvious question – how does the unit work? At a cursory glance, I didn’t see any ICs, so naturally I assumed that it was some form of self-feedback ringing converter. But there was only one transistor, and the transformer only had three connections – a primary pair and a tap. That could never work. As it turns out, they sneakily put the IC underneath the transformer. As a result, it took some hefty desoldering to get a sighting of the IC. The IC in question is a Dialog Semiconductor iW3688 AC/DC Advanced Digital Power Controller for Single-Stage Dimmable LED Drivers. This is a fairly reputable vendor, with this chip claiming to have excellent dimmer compatibility with leading/trailing-edge and digital smart dimmers with a wide dimming range of 1-100%. It claims to have a power factor >0.92 with <20% THD, an efficiency of >85%, start-up times of <0.5s (without dimmer), tight 5% current regulation and a suite of protections. Impressive performance claims all around. The above image also illustrates how the provided mains cable, stripped and bootlaced as supplied, really does get right to the capacitor C11 on the live side. Now the driver has been demystified, lets continue to the LED array. Behind the opalescent diffuser is the LED array. As promised, 7 LED packages are used, arranged as a single ring, with connections made by soldered wires in the centre. The internal metal bowl is used as a heatsink, with the white diffusing plastic “cone” stuck into place. The MCPCB is marked with HT-DLF-0701-90600 and AOT. The manufacturer could not be reliably determined, however, searching up AOT seems to potentially result in a false lead. With 7 LEDs, there’s not much you can do in arrangement, so everything is one series string. This is good from the perspective that there are less packages, so less likelihood for failure, and no multiple-parallel imbalance issues to deal with. The MCPCB also has “large” traces to enhance heat transfer from the LED package’s soldered legs through to the copper foil traces, to the aluminium MCPCB core, through to the heatsink at the rear. While they seemed to have tried their best with some applied thermal interface material, it seems they didn’t apply enough. Worse still, it seems their drill holes may have some burrs on the edge which are preventing proper thermal contact across the whole rear. When examining the paste on the rear, we can see the “brush” pattern as applied. 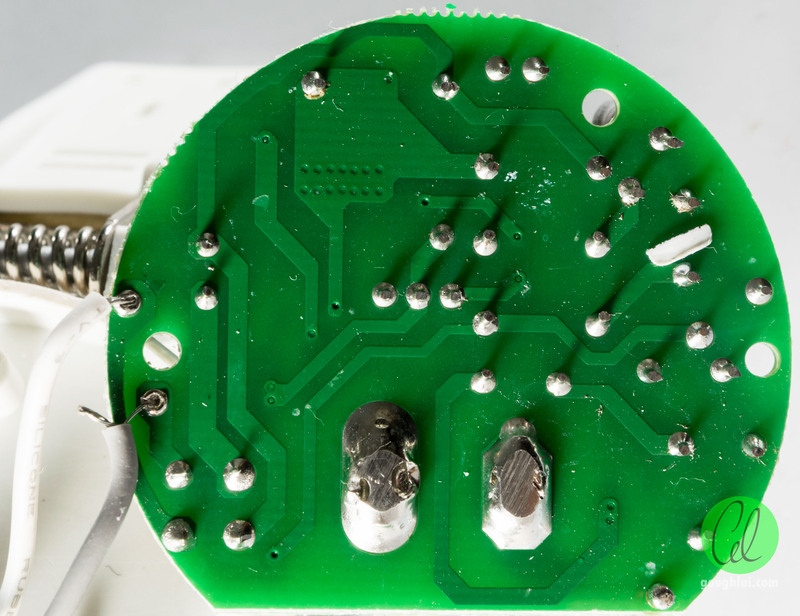 On the MCPCB itself, the majority of the area does not have paste residue marks. If the paste made good contact, I would expect the residue to be roughly even across the surface. Hmm. 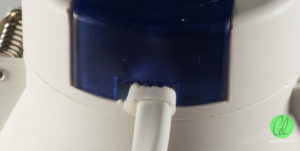 Part of the reason for this appeared to be the overtightening of screws, which sink into the plastic behind. One of the holes was completely cracked, and it’s unclear there is enough material for the screws to “bite” into, as the plastic the driver shell is made out of is relatively brittle. Notice the top left screw. What started off as marginally acceptable from an exterior appearance has been revealed internally to be made of sub-par components, with questionable construction. It’s surprising these things even work given the amount of problems that were identified, from poor soldering, through to poor thermal contact. 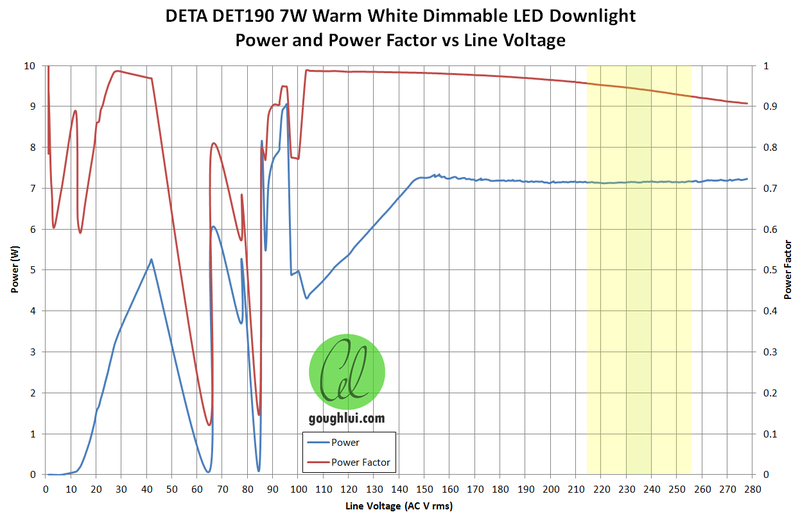 This unit was tested in very similar ways to other LED products in the past. 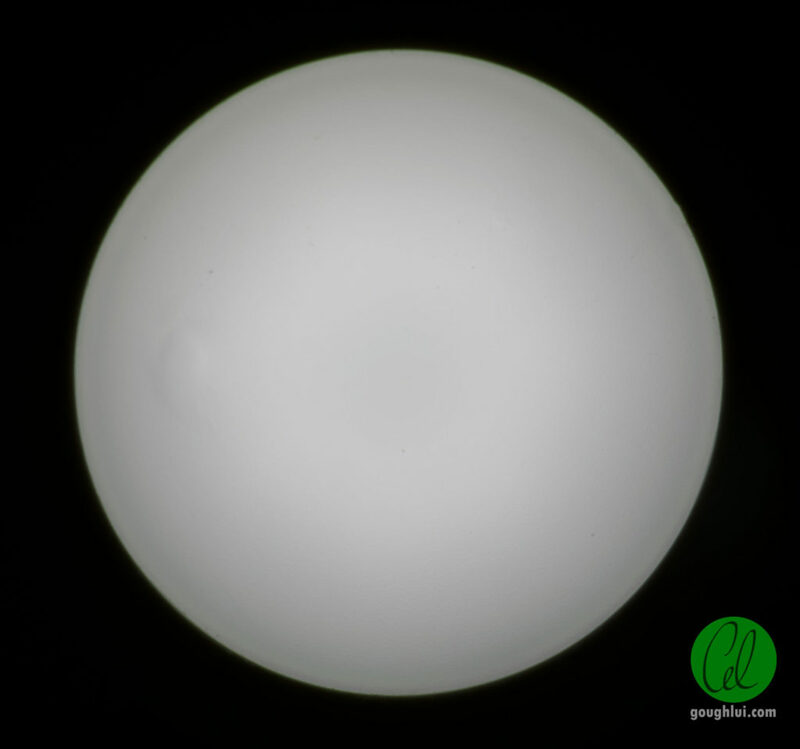 From a subjective experience point of view, the light was about as bright as claimed. It starts up almost instantaneously on application of power, and there was no acoustic noise issues running at full power. The output field was mostly uniform with the diffuser with a slight “donut” centre, which is not readily apparent in normal usage. No visible flicker was experienced at full power. The box claims a power consumption of 7W. When measured with the Tektronix PA1000, I determined the consumption to be about 7.17W at 230v (+/- 1%). Varying the input voltage using a Variac showed very tight active regulation, essentially the power consumption remained unchanged in the intended voltage band. The power factor achieved the 0.92 or greater benchmark, achieving about 0.94-0.96 inside the rated voltage band. While power factor is not as important for residences, large power users may be penalized for poor power factor, so a good power factor can be helpful there (and also reduce other costs, say in power factor correction banks). Correct operation was achieved down to about 146v, which is much below what is necessary. 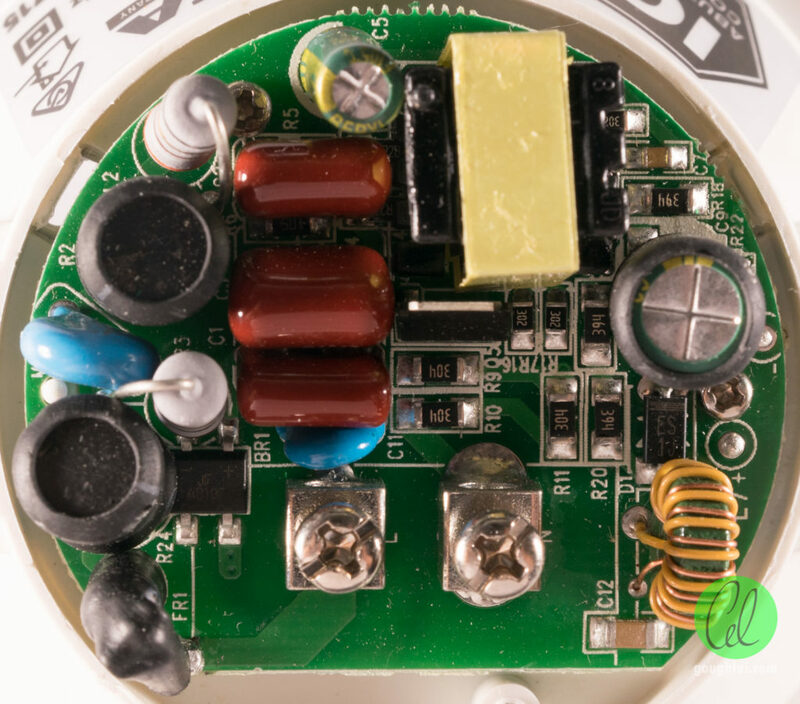 Below this, the driver was unable to maintain its output intensity, and below 104v, the driver began to cycle on and off randomly with no light output, but significant dissipated power. Whether this condition would result in harm to the driver is not known, but to have such deep undervoltage is not usual. As the output is not isolated, care was needed in measuring the output. The Tektronix PA1000 was used with an isolated power supply. Measured output voltage was 42.88v with a crest factor of 1.036. Output current was 148.41mA with a crest factor of 1.301. No frequency was recorded, indicating the output is DC with ripple. The output power is 6.36W, resulting in a driver efficiency of about 88.7%. A good result, and in line with datasheet expectations. The fixture was cycled ten times with the PA1000 on inrush current test mode. The resulting positive peak current was 1.626A, and negative was -1.622A. This implies the inrush current is effectively limited and is about 1.6A. It is therefore, possible to fit about 20 (or a few more) of these units onto a circuit without risk of tripping breakers. Testing of the dimming capabilities of the unit was complicated by the fact that I don’t have many dimmers, and there was literally no documentation as to qualified/recommended dimmers. Testing with my Nixon “Universal” dimmer proved to be unsatisfactory, as the dimmer applied leading-edge dimming rather than trailing edge. 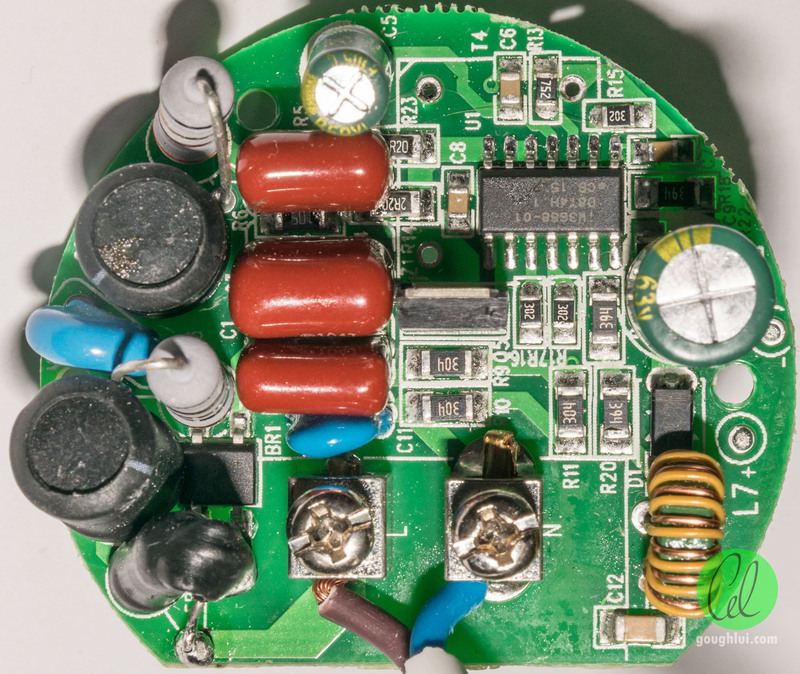 While the datasheet for the controller claims it is compatible, such arrangement results in horrible acoustic noise from the driver, causing a moderately loud buzz. Analyzing the situation with the PA1000 revealed that the “sharp” on transition of the leading edge causes the inrush current to reach levels up to 1A (when cutting-in at the peak of the sine wave). This stress on the dimmer will limit the number of units dimmable to just one or two, and is likely to hurt fixture lifetime too. Because the unit didn’t meet the minimum loading requirement on my particular dimmer, flickering was experienced at many dimming levels. 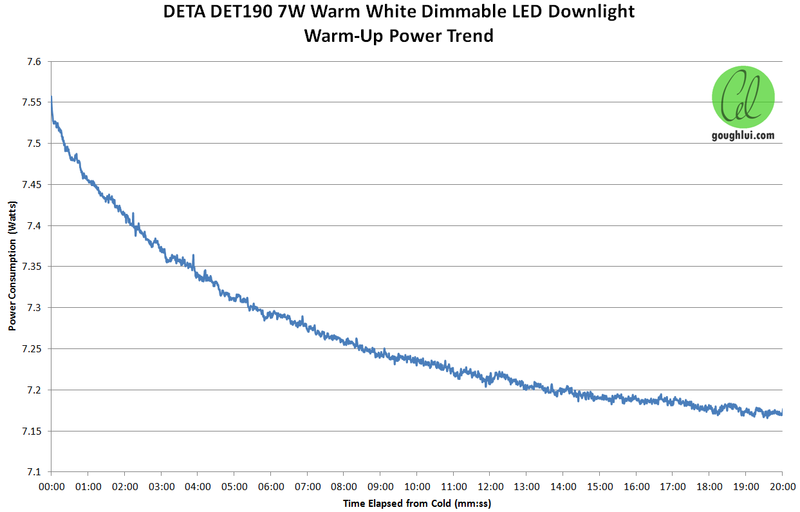 Dimming to the lowest setting did not quite reach the lows that the HPM DLI9002 did. Using my leading-edge IKEA Dimma lead, designed for lower loads, resulted in stable dimming but with the same acoustic noise. I think I’ll have to acquire some other models of universal and or trailing-edge only dimmers to be able to make a proper judgement call on the dimming capabilities of such LED luminaires. 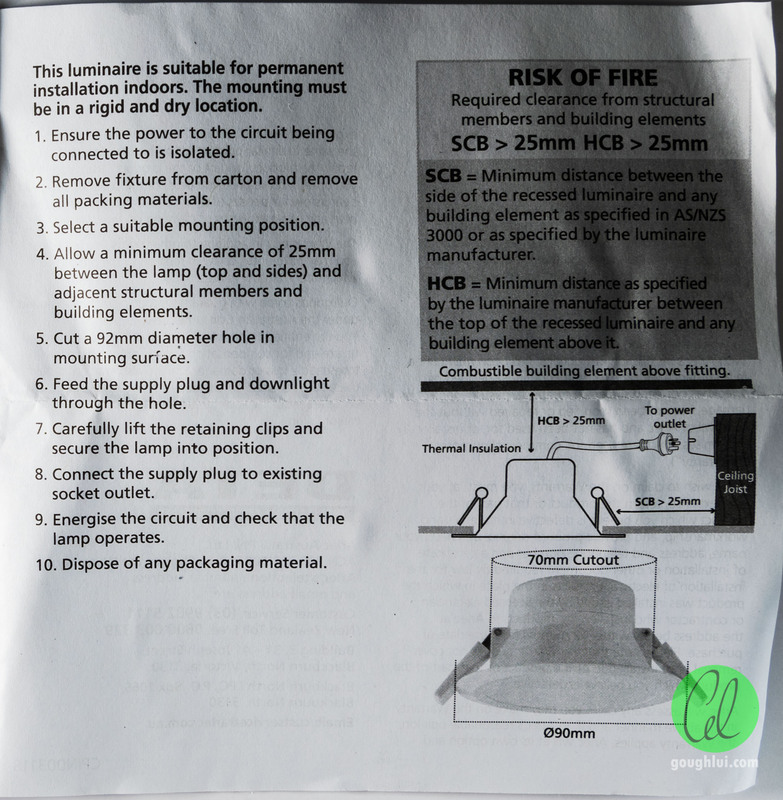 However, the lack of documentation of qualified dimmers suggests that users will probably have to play roulette to find a matching dimmer that meets their range requirements without having flicker or shimmer effects or excessive acoustic noise. 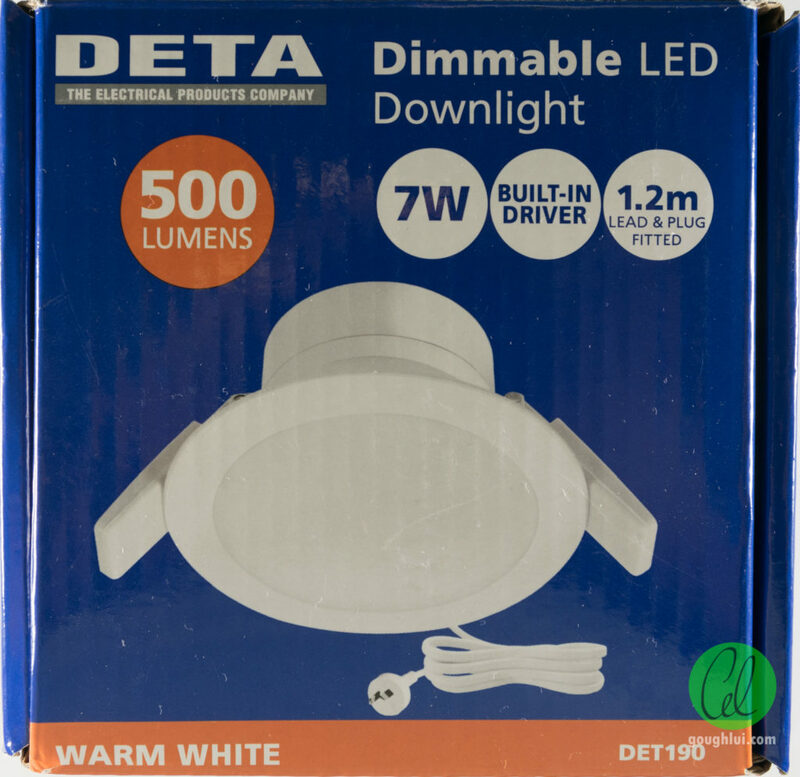 UPDATE: I ended up purchasing a DETA branded 150W “Universal” (trailing-edge) dimmer, model 6031, which has a minimum load requirement of 4W. With this dimmer, start-up takes about one second, ramping up from minimum brightness, but the output is stable. Dimming range is good, and there is no acoustic noise. As a result, it seems this may be a suitable dimmer, and not too expensive either. I left spectral content to the end, because I don’t have confidence in the spectrometer I am using. The results it is giving suggests that it is in the process of entirely failing, so I will not present figures for CCT/CRI. The graph doesn’t really tell us much, beside the fact it is using “conventional” white LED technology using phosphor with blue base LED. However, using the camera and RAW file processing method, the CCT detected was 2850K, close to the 3000K claimed. 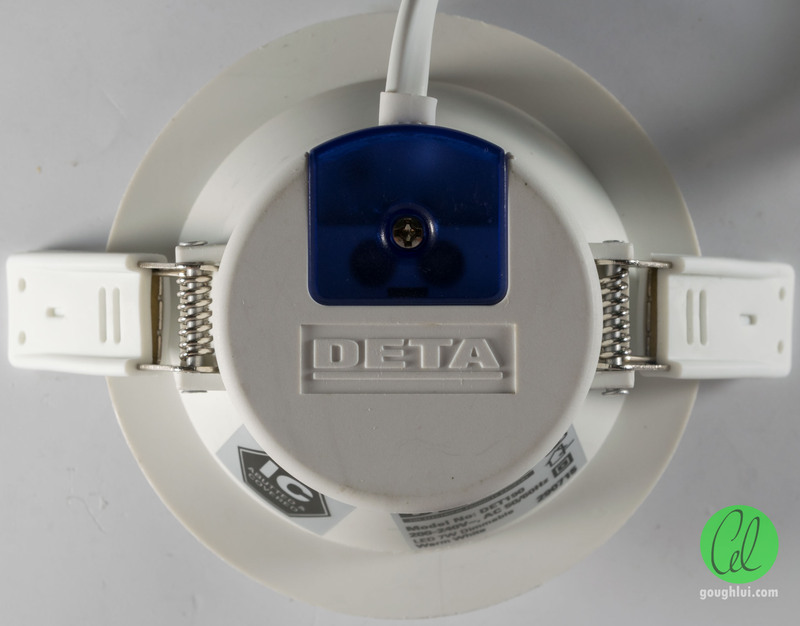 The DETA brand is not particularly inspiring from my experiences in the past, and this product seems to continue on that tradition. While on the outside, it looks passable, it was discovered the cable retention clip doesn’t even do it job properly. When tearing it down, it was apparent that sub-par capacitors had been used, and the quality of soldering was highly variable. It was particularly poor in the connection from the driver to LED array. 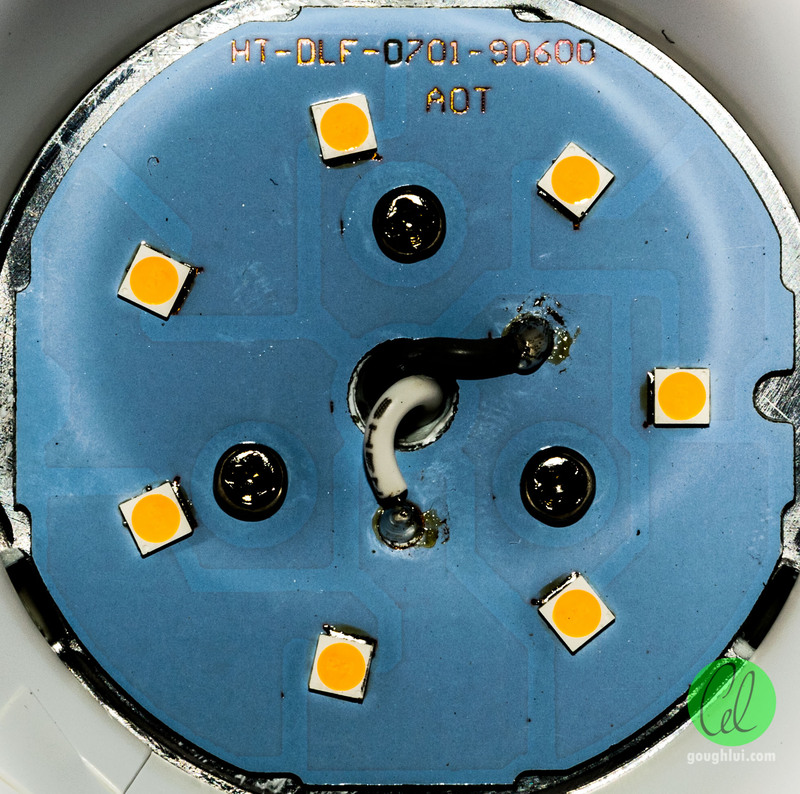 Further investigations showed that the contact between LEDs and heatsink were poor due insufficient thermal paste, construction issues in the heatsink holes which had burrs and damage to the casing was seen internally from overtightening of the screws. From a construction point of view, it was one disaster after another. The chipset used in this driver is quite a good quality unit, and it proved itself with good efficiency figures, relatively wide operating voltage range and good power factor results. Dimming was not successfully achieved without acoustic noise and stability issues, although this is likely because of the dimmers used with the unit. Documentation in regards to compatible dimmers is lacking. It is hard to recommend anyone actually purchase this unit, given the problems that were seen in the quality of construction. The real kicker is that the warranty itself is sub-par too, with just one year offered. The unit also does not have an IP rating, confining it to indoor usage only. In the end, because of the desoldering required to review the unit, I had to resolder the broken connections. I suspect I’ve done a much better job of this, and improved the unit in the process. This entry was posted in Electronics, Lighting and tagged led, lighting, made-in-china, review, review-challenge, teardown. Bookmark the permalink. 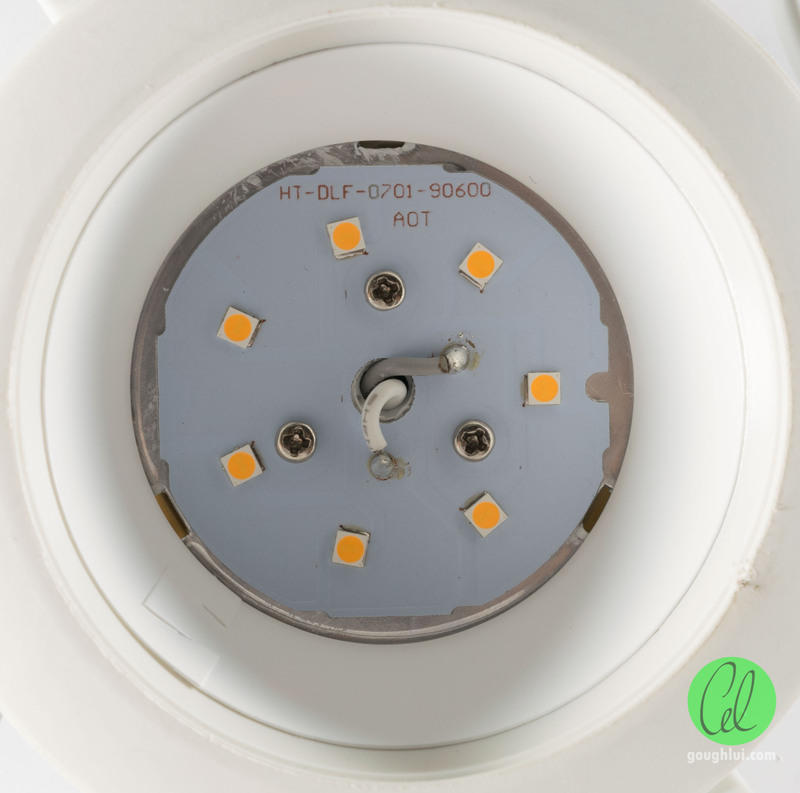 When I did the LED retrofit to my house (over 300 LED bulbs) I did quite a bit of comparisons to incandescent/halogen/LED lamps and came to the conclusion that the hot-wire bulbs put out an EFFECTIVE 10 lumens per watt (i.e. a 60 watt bulb delivers 600 lumens out the fixture). That is the rule-of-thumb value that I use when calculating what LED bulb can replace an incandescent bulb. Note that all of my bulbs are downlight style. Omnidirectional bulbs might be slightly different. I have a calibrated integrating sphere for measuring lumens. Beware of cheap LED bulbs (particularly from China). Their output seldom matches the stated level. In the world of LED flashlights it is particularly bad. There can be 3-5 “Chinese lumens” for each real-world lumen. The Public Lab one reminds me of the webcam VHS cassette box spectrometer. Ultimately, the resolution really depends on how nice you can get your grating, and it takes some calibration especially with grating position vs temperature, and isn’t going to have linear response out of the box owing to the sensor used. I don’t think I really have time for it – ultimately, if I want to be calculating CCT and CRI from it, it needs to be fairly well calibrated. I might have other options when I get reappointed by the university in a few weeks time. I’ve normally used about 16 lm/W as the benchmark for hot filament globes, as the old incandescents have been banned in Australia for a while, and they are closer to 10 lm/W, whereas the mains voltage halogens are reaching 14-21 lm/W depending on wattage rating. It’s a bit of an “average”, as longer life bulbs tend to give less, and probably only the better halogens can reach this level. Definitely, cheap LED bulbs from China have always been something I’ve been wary of, although the ones that do make it legally into Australia through proper channels often will meet their stated lumens because of a need to protect the brand reputation and potentially because they may need to meet energy standards testing to Australian Standards now and into the future. I suppose the big take-away message from this one is – even if it looks good from the outside, and it seems to work, it could be inches away from a problem. We bought some from Bunnings – they lasted a little over 12 months. 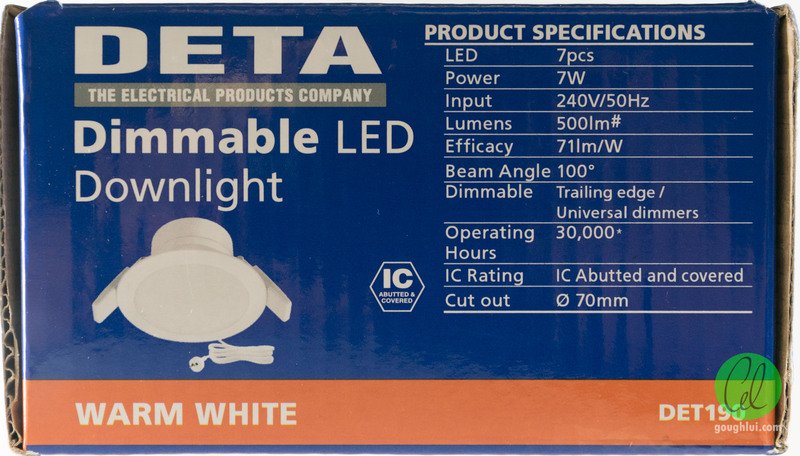 Bunnings didn’t want to know about it (no proof of purchase)and I rang Deta (number on box) and was told they are good for around 30,000 hours. Do you leave your lights on a lot I was asked????? About to replace them with another brand. 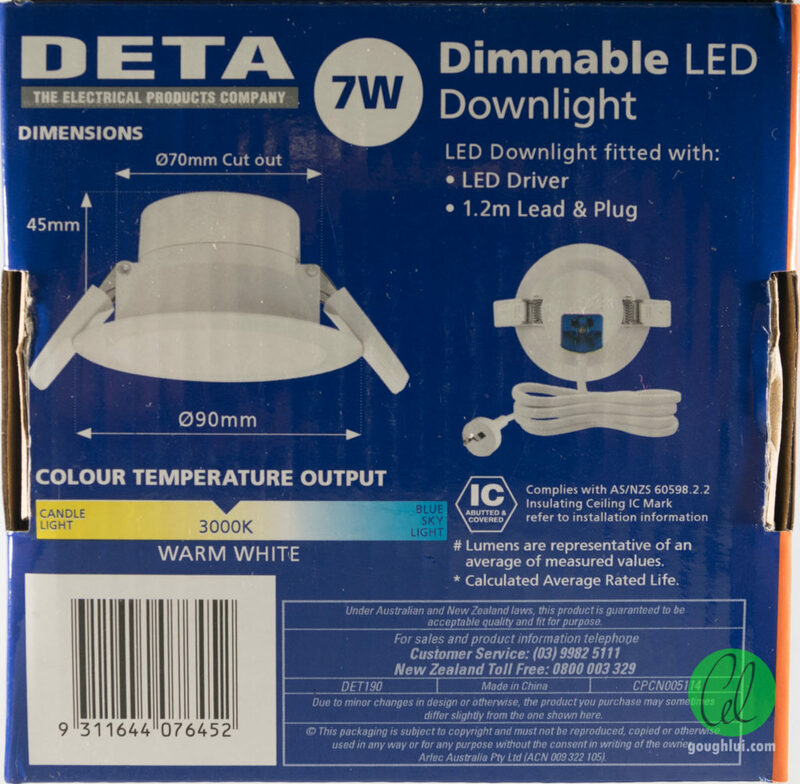 Rubbish in my opinion and whilst I was buying another brand at Bunnings another customer was picking up a few boxes of Deta lights and I shared my grief with him and he promptly put them back on the shelf doing himself a HUGE favour. That’s very disappointing to hear. There could be a number of reasons for failure – some of which may be repairable if you’re handy with electronics, a soldering iron and are experienced working with mains equipment. However, faults in the LED chips themselves (e.g. 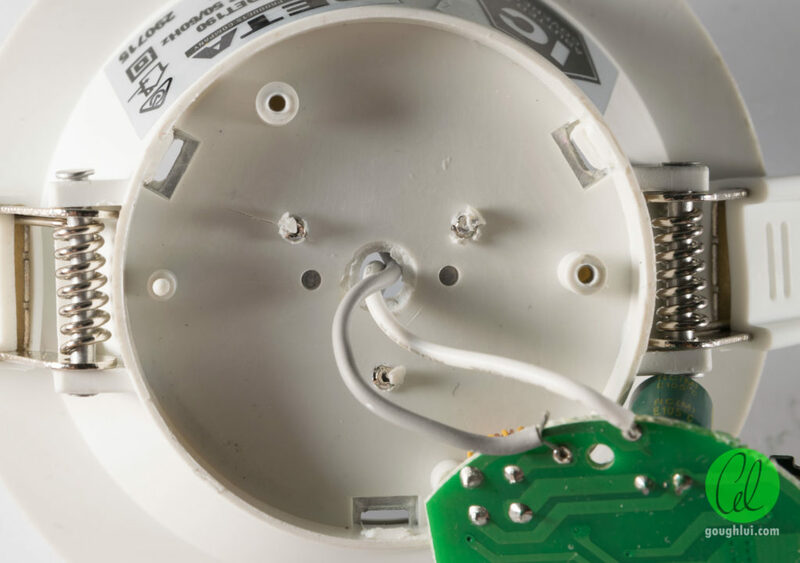 with the wire bonds) often causing rapid flickering which gets worse as the lamp warms up are often incurable short of “jumpering out” some LEDs. But even that is a temporary fix as the others are likely to fail as well. I wonder how yours failed exactly – as there are only 8760 hours in most years.